What a contest it has been! 18 entries and 3170 870 votes came in for the various participants. After the voting log was scrutinized for multiple voting and results tallied, the winner of the USD$100 Giveaway is Entry No. 3 submitted by Babe_KL. 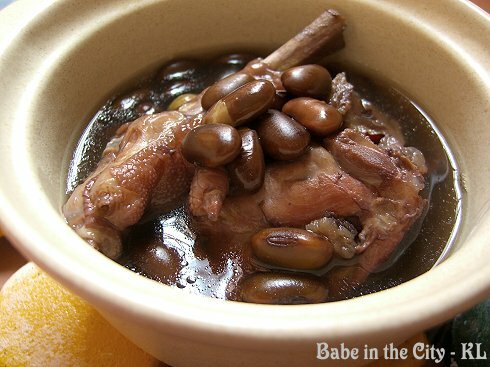 Babe_KL, who is a well known food blogger in Malaysia, cooked the nourishing Black Bean Soup. Being an experienced cook herself, she used the pressure cooker to cook this soup to great effect. Check out her blog for more simple and good food. Next, the 2nd placed winner is HN who cooked a local favourite, Chicken Rice in Rice Cooker. A domestic adaptation of the ever popular Claypot Chicken Rice, this is one of HN’s favourite “lazy weekend dish”. The picture of the Chicken Rice in Rice Cooker was proudly taken by HN’s hubby. HN gets a 2 month placement of 125x125ad on the sidebar of this site worth $80. The 3rd placing for this contest is won by The Cooking Momster who made a commendable attempt on one of my wife’s speciality, Mee Suah Kueh. Her family loved it and for a moment, they thought it was Lobak Kueh! The Cooking Momster gets a One month placement on the Featured Blogger Ad on the sidebar. Heartiest Congratulations to all the winners and a word of commendation to all who participated in this very first USD$100 Giveaway! Seeing the positive buzz and excitement created by this contest, I already have in mind another contest which I will be launching in the not too distant future. Watch this space! thanks pablo for organising this and taking the pain to sieve thru the votes esp those multiple ones from my fans! i’m glad to be the winner and happy to know some orphanages will have a new home, hopefully soon! Congratulations to all! Truly well deserved. I want some right now! Aiyah… missed by slightly more than a whisker 🙂 Still it was great fun and congratulations Babe KL! All in all, thanks for your efforts, really! Congrats to all 3 winners! Great contest! Helped unleased all the home-cooked creativity and goodness of healthy yummy food. I discovered a few other recipes too, in the process! Congratulations to the well-deserving winners! congrat congrat to those who win .. 🙂 Fun …. That is a really cool contest. Congratulations to the winners. They deserved it. Those recipes are excellent! Thanks! It was a lot of fun. Congratulations to the winners. I hope I timely catch the next contest — Feel free to notify me re same. « Voting for the USD$100 Contest Begins!